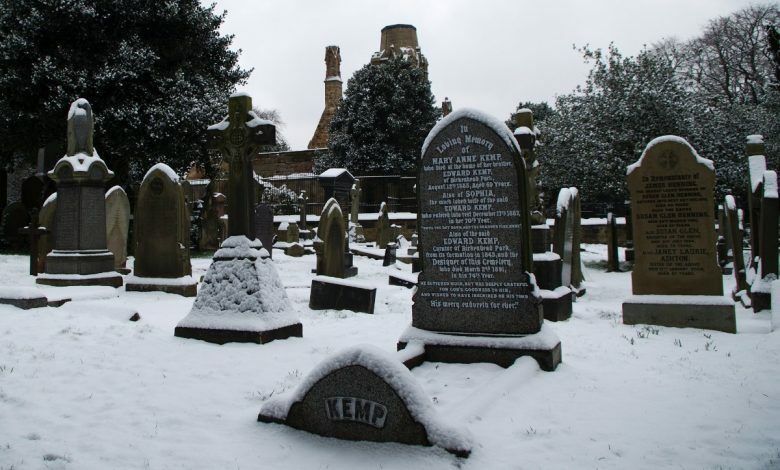 In November 1842, Birkenhead Commissioners agreed to form a public cemetery. In 1843 the Birkenhead Cemetery Bill was read for the third time in the House of Commons and passed. Birkenhead Commissioners then purchased land at Flaybrick Estate and general plans were drawn up by John Lister a local Civil Engineer and Surveyor. During the depression of the 1840’s, funds ran out bringing a lot of work to a standstill, and so people moved from Birkenhead to try and find work elsewhere. The 1850’s saw Birkenhead start to flourish again. Following the Burial Act of 1857, the Birkenhead Commissioners resurrected the scheme for Birkenhead Cemetery. There was debate as to who was to administer this, an independent burial board or the Commissioners. The Catholics, who were anxious that any cemetery should include a section set aside for their exclusive use, favoured a burial board. John Laird, Chairman of the Commissioners, wanted the cemetery under their control, and Mr Craven, one of the Commissioners, wanted a burial board established by the vestry. A poll was held, but the Catholics were outraged and turned their venom on the shipyards, gathering there to hurl stones and break windows. They then went to the front of the Town Hall, yelling and shouting in a furious manner. The police, however, succeeded for a time in maintaining order. Three priests along with Mr Edward Bretherton, solicitor, also used every exertion to prevent an outbreak, and ultimately succeeded in disarming part of the mob. At one point the state of things appeared so alarming that it was under contemplation to send to Chester for the military. A company of marines belonging to HMS Liffey, who had been ashore exercising, were called in, and they marched through Hamilton Square with bayonets pointed. Mr Laird won the poll and pledged that if the Commissioners established a cemetery, that the Roman Catholics, Dissenters and Church of England would all be placed on an equal footing. Edward Kemp, renowned landscape gardener and superintendent of Birkenhead Park, became involved in the cemetery design in the summer of 1857. Edward Mills, the Commissioners Surveyor, also submitted a plan showing the precise location and boundaries of land allocated for the Cemetery, but was not concerned with the laying out. Time dragged on and it was only in May 1861, when using Edward Mills’ original base map, that Kemp and Mills jointly submitted plans to the Commissioners for the actual laying out of Flaybrick. These plans were referred by the Commissioners for “further consideration” and with some modification were approved on 1 July 1861. A Cemetery Competition was held to select architects for the Chapels and other buildings, a notice advertising the competition was placed in the press in July 1861. The Architects appointed were Lucy & Littler, Liverpool; the builders John Middlehurst, St Helens; road, walks and drains William Rimmer, Bidston. Based upon the Gothic Revival style of architecture, there were originally identical linked Church of England and Non-Conformist chapels together with a separate Catholic chapel at the north end of the site, and offices and accommodation to ensure the efficient management and operation of services. They are built from stone from Flaybrick and Storeton quarries. The Cemetery of 16.5 acres was officially opened 30th May 1864, and named Birkenhead Cemetery. In 1892, the County Borough of Birkenhead looked at an extension for the cemetery, being Flaybrick Quarry. Again in 1898, a further extension was discussed, and in 1900 it was again extended into the quarry area. The total area was now 26 acres. The lower and newer area of the cemetery is built on top of a former sandstone quarry and is not part of Kemp’s original design. Stone from the quarry was used in construction of many local buildings including Birkenhead Docks and St James’ Church. Most of the memorials in this area date from the early 1900’s. It is also the location of Flaybrick’s largest War Memorial and two of Flaybrick’s large public graves. Despite initially gaining listed status in 1974, the chapels were used for the final time the following year, and the Roman Catholic chapel was demolished during 1975/76 and a Memorial Wall erected on its site. Grade II listed status was granted in August 1992 and the site also became a conservation area, but a programme of controlled ruination saw the spire taken down and the roof removed in 1996. In 1993 the Friends of Flaybrick was formed, then in 1995 Steve Titley was appointed as Ranger of Flaybrick, the first Council Cemetery Ranger in the UK. In 1996 The cemetery was renamed Flaybrick Memorial Gardens. In 2004 accreditation was secured for Flaybrick as A Significant Cemetery in Europe (ASCE) and in 2008 Birkenhead hosted the ASCE conference. In 2009 the Memorial inscription service started. The Friends and volunteers over many years have recorded all the monumental inscriptions, and it is a service we now provide for a small charge. In 2011 the Great Trees of Wirral Project was started, and 2012 Flaybrick Geodiversity trail was set up. A slow but gradual increasing awareness of the historical importance of the site saw the Council obtain matched funding from Heritage England, and in 2015 a programme of partial restoration of the chapels was commenced. 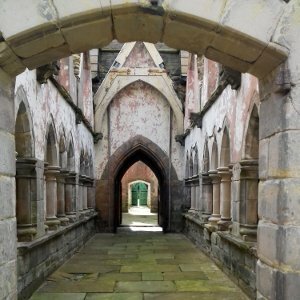 This work culminated in the official reopening of the chapels by the mayor of Wirral, Councillor Ann McLachlan on 3rd July 2017, and now for the first time in more than twenty years, they are open to the public as part of the guided walks programme organised by the Friends of Flaybrick. Flaybrick is the final resting place of over 100,000 people from the Wirral area and beyond and, whilst it is no longer a working cemetery, burials do occasionally take place in existing family graves. Working with Wirral Council and Heritage England we are working for the future of Flaybrick. Some of our Friends work from 10-12pm on Thursday and Saturday morning to cut back overgrown areas of the cemetery. If you wish to help please come along and speak to our volunteers, you will be made very welcome.